Now that you’ve seen how to automatically import data and run analyses in my previous post, let’s create the Monthly Report! I will be using a Microsoft Word Document (Office 2010) and adding bookmarks to act as placeholders for the Graphs, statistics, and boilerplate conclusions. Open up an existing report that you have previously created in Microsoft Word. Highlight a section of the document where you would like to place the created Minitab graph or statistic. Repeat the steps above for each graph and statistic that will need to be inserted into your report. Now go to the Developer tab in Microsoft Word, and click on Macros. Here you can enter the name of your macro and click Create. Let’s first make sure we reference the Minitab COM API, so Microsoft Word can talk directly to Minitab. 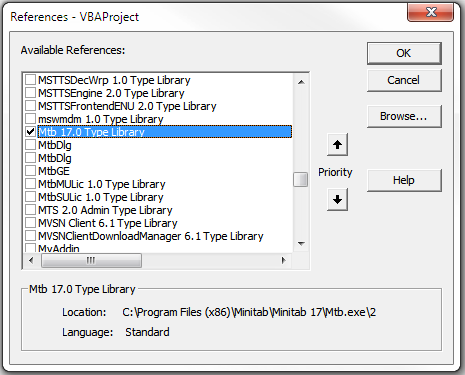 In Visual Basic for Applications, go to Tools > References, and check the box for ‘Mtb 17.0 Type Library’.
' We can even have Minitab run behind the scenes, hidden from the user. Now we can tell Minitab to save the graphs as JPEGs and place them in the Report. Once again, you’ll need to change the file locations to match yours. 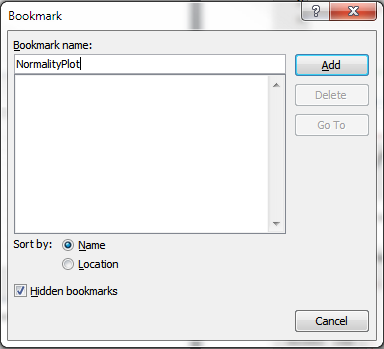 ActiveDocument.Bookmarks("Pvalue").Range.Text = "Data does not pass Normality Test"
ActiveDocument.Bookmarks("Pvalue").Range.Text = "Since Normality Test P-Value is greater than 0.05. Assume Normal Distribution"
ActiveDocument.Bookmarks("OutOfControl").Range.Text = "Data appears to be stable over time"
ActiveDocument.Bookmarks("OutOfControl").Range.Text = "Investigation is needed as 1 data point was found to be out of control." ActiveDocument.Bookmarks("OutOfControl").Range.Text = "Investigation is needed as " & oocPoints & " data points were found to be out of control." ActiveDocument.Bookmarks("cpk").Range.Text = "Cpk does not pass Acceptable Guideline of 1.33." ActiveDocument.Bookmarks("cpk").Range.Text = "Cpk passes Acceptable Guideline of 1.33. Process is operating at Acceptable level." Running the Microsoft Word macro automatically generates a report that communicates with Minitab Statistical Software (in the background) and provides an understanding of our process for the current month. And now that the code is written, you have a fully functioning Report generation tool that works with the press of a button. If you are intimidated by this type of process, we provide a service that does the programming for you. More information can be found here. You can also e-mail us, and I will personally follow up to see if we can automate any processes for you. Also, if you would like to see additional examples illustrated in a blog post, feel free to post a comment below. For Minitab Command Language, go to Help > Help and click the link for Session Commands. For Minitab’s API, go to Help > Help and click the link for Minitab Automation.